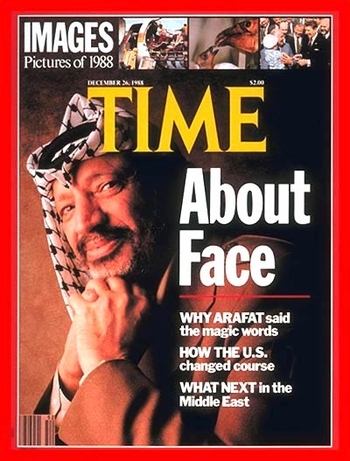 The U.S.-sponsored Israeli–Palestinian "peace process" began in December 1988, when Palestine Liberation Organization leader Yasir Arafat met American conditions and "accepted United Nations Security Council resolutions 242 and 338, recognized Israel's right to exist and renounced terrorism" (actually, given Arafat's heavily accented English, it sounded like he "renounced tourism"). It was huge news in December 1988 when Arafat said he renounced terrorism. That peace process screeched to an end in December 2016, when the U.N. Security Council passed Resolution 2334. Khaled Abu Toameh, perhaps the best-informed analyst of Palestinian politics, interprets the resolution as telling the Palestinians: "Forget about negotiating with Israel. Just pressure the international community to force Israel to comply with the resolution and surrender up all that you demand." As 28 years of frustration and futility clang to a sullen close, the time is nigh to ask, "What comes next?" I propose an Israeli victory and a Palestinian defeat. That is to say, Washington should encourage Israelis to take steps that cause Mahmoud Abbas, Khaled Mashal, Saeb Erekat, Hanan Ashrawi, and the rest of that crew to realize that the gig is up, that no matter how many U.N. resolutions are passed, their foul dream of eliminating the Jewish state is defunct, that Israel is permanent, strong, and tough. After the leadership recognizes this reality, the Palestinian population at large will follow, as will eventually other Arab and Muslim states, leading to a resolution of the conflict. Palestinians will gain by finally being released from a cult of death to focus instead on building their own policy, society, economy, and culture. 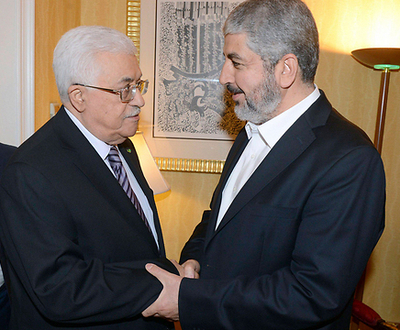 Time for Mahmoud Abbas (L),Khaled Mashal, and the rest of that crew to realize that the gig is up - and they lost. While the incoming Trump administration's Middle East policies remain obscure, President-elect Trump himself vociferously opposed Resolution 2334 and has signaled (for example, by his choice of David M. Friedman as ambassador to Israel) that he is open to a dramatically new approach to the conflict, one far more favorable to Israel than Barack Obama's. With his life-long pursuit of winning ("We will have so much winning if I get elected that you may get bored with winning"), Trump would probably be drawn to an approach that has our side win and the other side lose. Victory also suits the current mood of Israel's prime minister, Binyamin Netanyahu. He's not just furious at being abandoned in the United Nations, he has an ambitious vision of Israel's global importance. Further, his being photographed recently carrying a copy of historian John David Lewis's Nothing Less than Victory: Decisive Wars and the Lessons of History (Princeton University Press, 2010) signals that he is explicitly thinking in terms of victory in war; Lewis in his book looks at six case studies, concluding that in each of them "the tide of war turned when one side tasted defeat and its will to continue, rather than stiffening, collapsed." 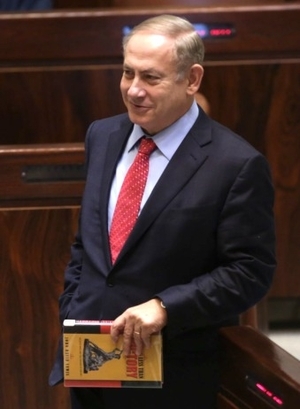 Netanyahu carrying John David Lewis's "Nothing Less than Victory." Finally, the moment is right in terms of the larger trends of regional politics. That the Obama administration effectively became an ally of the Islamic Republic of Iran scared Sunni Arab states, Saudi Arabia at the fore, into being far more realistic than ever before; needing Israel for the first time, the "Palestine" issue has lost some of its salience and Arab conceits about Israel as the arch enemy have been to some extent abandoned, creating an unprecedented potential flexibility. For these four reasons -- Security Council Resolution 2334, Trump, Netanyahu, and Iran -- the moment is right to meet the new year and the new administration with a revamped Middle East policy, one aiming for the Palestinians to "taste defeat." Trump's Middle East Policy Revealed?